Complete text of the accurate, readable, and clear New International Version (NIV), the world's best-selling modern English Bible translation Complete 4-Volume set includes The Torah and Former Prophets, The Latter Prophets, The Writings, and The New Testament Chapter and verse numbers, footnotes, subject headings, and other additional materials have been removed from text The books are presented according to what scholarship has determined is their natural internal divisions Individual books that later tradition divided into two or more parts are put back together again The books are arranged in an order that helps you better understand the Bible flow Ribbon marker in each book 2-color interior Thick, high-quality paper The Bible text is presented in an elegant 10.3 type size 10.3-point type size. 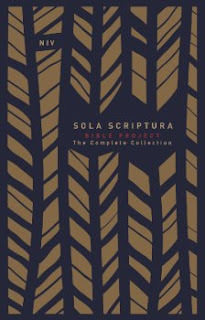 The presentation of the Scriptures in this 4 Volume hardcover set of NIV Sola Scriptura from The Bible Project without the verse and chapter divisions makes reading the Bible, like reading a book. It will give the opportunity and desire to read Gods word in a more informal fashion because you aren't seeing the numbers and aren't focused on the chapters, which at times can give the effect of reading out of habit and not out of desire. What I love is that this format encourages the reader to dive in and read in complete context, while enjoying the scriptures in a new format. The NIV test of the scriptures are broken up into four volumes. The Torah, former prophets, latter prophets, the writings and the New Testament. This doesn't feel like your typical standard Bible. It has a great font size that is readable. This isn't a study Bible with cross references, maps or pictures, but straight words. The presentation of this four volume series is stunning and well crafted in a hard bound set, with navy and beige in metallic red for the titles. It is volume of Bibles that I will be keeping on my shelves for years to come. I love the navy ribbon sewn into each volume. This would make a wonderful Christmas gift for anyone. I give the NIV Sola Scriptura 5/5 stars. Thank you to the publisher for providing a complimentary copy. A favorable review was not required.